50Hz square wave example for PIC16F1829 | ad hocumentation • n. fast, instinctive documentation of ideas and solutions. 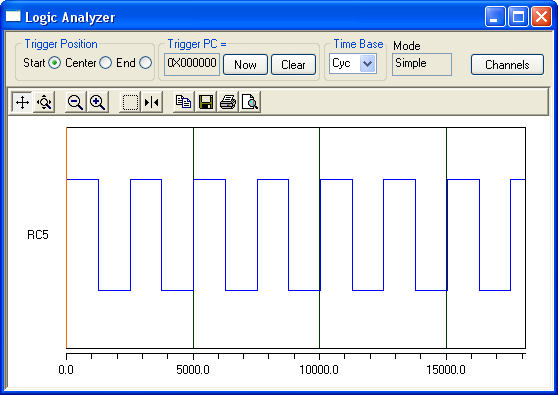 This post presents two example programs for the PIC16F1829 microcontroller that generate 50Hz square waves. The first example uses simple bit banging to generate the waveform. The second example uses the dedicated PWM hardware module. In this example program, I set a single pin as a digital output (RC5), then generate a 50Hz square wave using straightforward bit banging. The clock oscillator is left at its default frequency of Fosc = 500kHz. Therefore, the oscillator period Tosc = 2us. Since the PIC16F1829 performs one machine instruction every four oscillator cycles, the instruction cycle, Tcy = 8us. I don’t have a PIC16F1829 to try this out on, so the best I could do was test it using MPLAB SIM (the simulator in MPLAB v8.50). Here’s a screenshot I captured of the Simulator Logic Analyzer tool (under the View menu in MPLAB) displaying the generated waveform. The x-axis units in the figure above are instruction cycles, so the period of the generated signal is approximately 2500 instruction cycles. Careful examination of the waveform in the figure above reveals that the period is actually not precisely 2500 instruction cycles. This may be due to the overhead associated with the additional instructions caused by the while loop and bit-banging. If precision is required, the delay values could be carefully tweaked to compensate. However, it is worth bearing in mind that the frequency of the internal RC oscillator can vary, so if precision is required an external crystal oscillator might be a better choice. The program can get on with other tasks while the square wave is generated continuously in the background by the dedicated PWM hardware module. Since there are no extra instructions associated with a while loop or anything else, it’s much easier to determine the exact length of the waveform period and pulse width (measured in instruction cycles). This entry was posted in PIC and tagged 16F1829, bit banging, example, frequency, MPLAB, PIC, PIC16F, PIC16F1829, simple, square wave, tutorial, XC8. Bookmark the permalink. Haha… actually i already have did the “lazy way” as you do and i got the same result. But after i saw your post, what i willing to have, is learn a different method to get the 50Hz via your way. It look more “Advanced”. Ok, I’ll try to add another example using the PIC’s hardware PWM generator. I don’t think I’ll have time to do it today though. not we could just use the Proteus for the simulation? Yes, you can probably simulate it in Proteus (although I haven’t used that software myself). The real PIC has dedicated hardware for generating PWM signals very precisely in the background while your C program is getting on with other tasks. Proteus can probably simulate that hardware functionality, but when you run it on the real system, the PWM will be generated by dedicated hardware on the chip. When I said about using the dedicated hardware to generate the squarewave, that was in contrast to the bit banging approach – writing a loop to set a digital output pin equal to 0, 1, 0, 1, 0, 1,… etc. Hopefully my example which I will post soon will clarify the difference. Ok, I added in another example. This time I used the PWM hardware module, which is probably a better idea in the long run. Let me know if you have any questions. it take me few days to understand the code. thank you VERY much, if I have somemore question i’m will back here again. You’re very welcome! Best of luck getting whatever you’re working on finished. Hey I am using a PIC 16F1829 and I want to determine the frequency of an incoming square wave how would I go about this. I am trying to use the ccp_capture_div_16 but the code it proving to be difficult can you help? Thanks for the examples! They’re great, but as I try to soak this up and understand it, I have some questions about the hardware PWM example. Following your example, the PWM Period = (155 + 1) * 64 * .000008 which for me comes to 79.872ms (about 25 Hz). Also according to your example, the Pulse Width = 78 * 64 * .000008 which comes to 39.936ms which does appear to be 50% duty cycle of the 25Hz frequency. Can you clear up this misunderstanding? Also can you explain why there was no need to take the DC1B (2 LSB of duty cycle) into consideration in this example? I would think that minimally the “78” would need to be bit shifted into CCPR1L (8 MSB of duty cycle). I must be missing something though because I do appear to get a 50% duty cycle using your example code. Actually 79.872ms is closer to 12.5Hz I think…I must be overlooking something big while trying to learn this. Perhaps you meant to use 16 as the TMR2 prescaler? That works out to 19.968ms as you have written in the comment of your code. Sorry for all of the messages; feel free to just delete them. I’m just trying to get a handle on this stuff! Thanks for your comments. Looking at it now, I think you’re dead right that something was out of place here. I wrote this example upon request from a reader and unfortunately I didn’t (and still don’t) have a chip to test it on, so I didn’t spot the problem. I’ve updated the code in the second example (hardware PWM module) to set the prescaler to 16:1. I think it should now be a 50Hz waveform with a 50% duty cycle! To give better PWM resolution, the 10-bit duty cycle value is actually a multiple of the oscillator period (Tosc), rather than the instruction cycle (Tcy) which is used for most other time values. Note that Tosc = Tcy / 4, so that results in 4 times higher resolution. Personally, I find this confusing! Even though I’ve been using PICs for years, I still find myself making silly mistakes because of the way the PWM registers are laid out. Anyway… bits 5 and 4 of CCP1CON (that’s DC1B1-2) are the two least significant bits of the 10-bit duty cycle value. The 8 most significant bits are in CCPR1L. Basically, in my example, I’m just leaving the two least significant bits set to zero (the default) and writing 8-bit duty cycle values into CCPR1L. Even though I’m leaving the two 0 bits untouched, they still get added onto the end my 8 bit CCPR1L value, with the effect of multiplying it by 4 (equivalent to left bit-shifting the CCPR1L value by 2). Tcy = 4 * Tosc. Hopefully that helps to clarify it! If you can check the updated example on your hardware, I’d really like to know that it’s correct, so please let me know how you get on. Yep, that clarifies a bunch! Actually plugging in the numbers according to the datasheet’s formula for the pulse width, I get a value of 307.5 which is closer to 77 for CCPR1L when divided by 4, but that’s splitting hairs. I’m in the middle of another project at the moment (that’s why I was researching PWM to begin with) so it may be a few days, but yes, I’ll check the results of your hardware example on my chip & scope and let you know. I’m near 100% sure that it’s correct though. I actually only calculated the PR2 value directly to get as close to 50Hz as I could. Then I just calculated the CCPR1L value from the PR2 value to give a 50% duty cycle, i.e. I haven’t really thought through the implications of the 2 least significant bits in the 10-bit duty cycle value. I was really just thinking of the duty cycle as an 8-bit value in units of Tcy, which is a little bit sloppy, but that’s how I was calculating it. Either way, it’s pretty close! Thanks again for picking this apart so carefully – it’s always good to iron out a mistake like this since it can cause so much confusion for others trying to make sense of example code. There’s no need to post this to your blog because I want to verify the results on a real oscope, but my diy usb scope is showing the period to be about 40ms…still twice what we expect. I’ve checked & triple checked the calculations and the value of the TMR2CON register, and I come up with the same values that you have. If I change the Fosc to 1MHz, then I get a 20ms period. But my oscope was a project that I found on the net and built. It’s value for the period might not be correct. I’ll try to have someone verify those results for me on Monday on a real scope. Based on section 5.2.2.5 of the datasheet, my understanding is that the default frequency of the internal oscillator is 500 kHz (it’s described as the “Default after Reset”). In most of the PIC microcontrollers I’ve used, Tcy = 4 * Tosc (i.e. one instruction is carried out every 4 oscillator cycles). Based on Figs 8.3 and 8.4, it looks like this is the case for the PIC16F1829. Since I don’t have an actual PIC16F1829 chip, it’s difficult for me to confirm my above assumptions. It took me a while fishing around the datasheet to work out what the default should be, so I could easily have missed something! If the first example produces the right frequency but the second one doesn’t, that will help to pin down the problem because we’ll know that Tcy really is 8us. Could you check that please? I get the same 40ms period using the bit banging code. I don’t trust my scope though, so I’ll get a real electronics engineer to check it on a real scope in a few days. c.) Tcy is not equal to 4*Tosc on the PIC16F1829. I’ll be back in the office tomorrow. I’ll ask around to see if anyone has a PIC16F1829 I can borrow to try the code out myself. which should set the frequency to 0.5Hz. In other words, the LED should be off for one second, on for one second, and so on. It should flash 5 times in 10 seconds. Yep, _delay(125000) blinks an led on 1 second & off 1 second. I’d say that it’s my scope. It was a USB project that I downloaded from the net with the software to run it…could be a bug with the software or maybe I messed up the circuit somewhere. I’ll still try to check it on a real scope tommorrow. Ok, that’s an interesting development! Sounds like it might be the scope in that case. The good news is that since it’s out by a factor of 2, hopefully the scope problem might be something that’s easy to correct. Anyway, thanks for the updated and please let me know what you see when you check it on another scope. OK, I just confirmed that the period is indeed 20ms, so your code for the hardware PWM is spot on. It’s my scope that seems to out by a factor of 2. Unfortunately I downloaded the hex & software, so I have no source code to work with. As long as it’s always a factor of 2, I can deal with it for now. Thanks for humoring me through all of this! Not at all! I’m happy to be of assistance. Also, don’t forget that there actually were problems with the original version of the code that I had in the post, so thanks again for helping to iron those out. I’m curious about the DIY oscilloscope you’re using by the way. Could you post a link to it please? I remember that some of the components on the PCB didn’t match with the schematic, so maybe I have some parts misplaced. At any rate, for my needs it’ll probably do for now. That’s an interesting design. Looks useful! Thanks for the link. I’ll have to keep it in mind for future reference. I want to create an automatic varying DC source, 90s for 0.25V and 60s for 0.8V.